The Patriots and Eagles stars are ready to guide their teams into Friday night's preseason encounter. FOXBOROUGH, Mass. 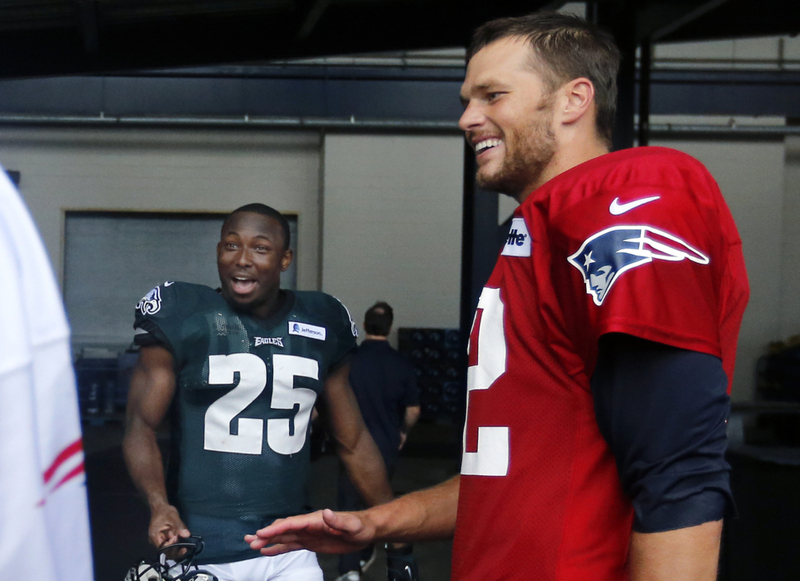 (AP) — Still wearing their uniforms, Tom Brady and LeSean McCoy smiled and chatted with each other after their teams’ joint practice. After the Patriots made it to the AFC championship game last season and the Eagles reached the playoffs under new coach Chip Kelly for the first time in three years, that prospect isn’t so improbable. McCoy led the NFL with 1,607 yards rushing and 314 attempts. His 5.12 yards per carry were second among runners with more than 10 rushes per game. Maclin may sit out Friday night’s game after sustaining a hamstring injury Wednesday that kept him from practicing Thursday. He didn’t think it was serious. Brady also has plenty, especially if tight end Rob Gronkowski can stay healthy after being limited to seven games by back, forearm and knee injuries. Julian Edelman had a career-high 105 receptions and running back Stevan Ridley is a threat if he can solve his fumbling issues. It all starts with Brady, who is likely to play Friday night after missing the Patriots’ 23-6 loss to the Washington Redskins in the opener. Patriots coach Bill Belichick is hoping for substantial improvement after the loss to Washington in which the Patriots were shut out until the final two minutes. Of course, most of his starters didn’t play. But McCoy and Brady didn’t share any vital information when they spoke after Wednesday’s workout.